366 Fall Safe Harness A universally sized fall protect..
366B Riggers Fall Safe Harness A universally siz..
366B Riggers Fall Safe Harness A universally sized fall protection harness to fit a wide ra..
367 Fall Safe Pro Harness / Victim Harness A uni..
367 Fall Safe Pro Harness / Victim Harness A universally sized fall protection harness to f..
368 Yates Kevlar Ladder Belts Class I ladder/persona..
368 Yates Kevlar Ladder Belts Class I ladder/personal escape belt. Extra large, double locking qu..
370 Yates SCBA Ladder/Escape Belt Kevlar Class I ..
370 Yates SCBA Ladder/Escape Belt Kevlar Class I ladder/personal escape belt. Easily fitted t..
371 Yates K/371K-XL Kevlar Truck Ladder/Escape Belt Ke..
371 Yates K/371K-XL Kevlar Truck Ladder/Escape Belt Kevlar Class I personal escape belt. 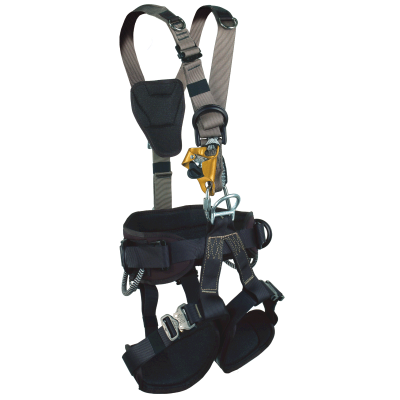 Utilizes..
367 Fall Safe Pro Harness / Victim Harness ..
367 Fall Safe Pro Harness / Victim Harness Patient packaging and extrication system c..
558 Yates Fire Tool Holster Tool/axe holder that f..
558 Yates Fire Tool Holster Tool/axe holder that fits most harnesses. Fits onto any webbing u..
319CPJ Special Forces Rappel Belt with Cobra Buckle Waist..
319CPJ Special Forces Rappel Belt with Cobra Buckle Waist and Legs SKU: 319CPJ Unique new ..
323 Kevlar Ladderman Harness Same construction as Ladd..
323 Kevlar Ladderman Harness Same construction as Ladderman Harness manufactured from heat resist..
324A Ladder Hook Extensions Aluminium Allows t..
324A Ladder Hook Extensions Aluminium Allows the firefighter to attach themselves safely ..
324C Ladder Hook Extensions Steel Allows the f..
324C Ladder Hook Extensions Steel Allows the firefighter to attach themselves safely to a..
330 NFPA Full Body Harness NO Pads Designed for ..
330 NFPA Full Body Harness NO Pads Designed for fire department, rescue, military, industria..
380 Voyager Full Body Harness Voyager Harness now come..
380 Voyager Full Body Harness Voyager Harness now comes with same width waist pad as Rope Access ..
384 Technical Rescue II A tuned down supe..
384 Technical Rescue II A tuned down super lightweight version of the popular Voyager..
386 Basic Rigging Harness A tuned down super light w..
386 Basic Rigging Harness A tuned down super light weight version of the Voyager Riggers Harness..
330A NFPA Full Body Harness (Padded) Designed fo..
330A NFPA Full Body Harness (Padded) Designed for fire department, rescue, military, industr..
380R Voyager Riggers Harness For professional use in s..
380R Voyager Riggers Harness For professional use in stage rigging and construction applications ..
536 10 ft. Pocket Ladder with Hook – Terra/Coyote D..
536 10 ft. Pocket Ladder with Hook – Terra/Coyote Designed by Special Operations personnel to eas..
387 Basic Rope Access Harness A tuned down ver..
387 Basic Rope Access Harness A tuned down version of the RTR Tower Access harness. Waist..